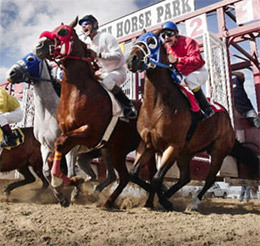 North Dakota Horse Park hosted the NDHP Open Quarter Horse Futurity (not black type) on Saturday's race card. FARGO, ND�JULY 23, 2016�Jim Fleming's owned-and-trained Curious James held off First Prize Desirio by a neck Saturday afternoon to win the $4,900 North Dakota Horse Park Open Quarter Horse Futurity (not black type). Missin Oklahoma finished a head off her stablemate for third place in the blanket finish. Ridden by jockey Zack Ziegler Curious James completed the 350 yards in :18.490 seconds to pocket the winner's purse of $2,450. It was the first win in two starts for the son of multiple stakes winner IVORY JAMES. He finished third in his maiden debut July 3 at Chippewa Downs. Mark Wilson bred Curious James in Minnesota from the Takin On The Cash mare Takin On The Crunch. A $23,000 Ruidoso Select Sale Yearling graduate, First Prize Desirio races for owners Jeff and Eva Hepper. Junior Dolphus conditions and Anthony rode the Weetona Stanley and W.E. Smith Oklahoma-bred. First Prize Desirio has compiled a (5) 1-1-1- record and earned $3,288. Also an Oklahoma-bred, Missin Oklahoma is owned by the Heppers and trained by Dolphus. Jordan Olesiak rode the homebred. He earned $588 for the effort. Paint Your Shamrock, First Heartbreak and Cos I Can completed the field.